I have some 20% off codes from DriveThruRPG/RPGNow for Iron Dynasty, Volume 3 of the Field Guide to Superheroes, VampireHunter$, Genius Guide to Another 110 Spell Variants and a cof other fine games/supplements. This code will be good until September 20, 2011. I am not responsible for the sale code, so the items covered and length of time the code works are not up to me (nor can I change them). The 20% off code for these PDFs is AfterGenConGlow2011. Apply it in the coupon space when you get to the checkout on the site. I have included an affiliate code that I'd appreciate you keeping up as you go through the process. The way that I had these attendance numbers explained to me on Twitter was this: Turnstile numbers are Badge Per Day, so a weekend (4-day) badge would equal four Turnstiles, while unique equals the number of different people. A person buying a Friday/Saturday badge would be one Unique and Two Turnstiles. Hopefully that makes sense of the numbers for everyone, or at least as much sense as the system for generating those numbers makes. INDIANAPOLIS (August 11, 2011) - Gen Con Indy, the nation’s largest annual consumer fantasy, sci-fi and adventure gaming convention experienced stunning growth this year. Turnstile attendance was over 119,707 with 36,733 unique attendees present for 96 hours of gaming, cosplay, music, shopping and more. This positive spike in turnout represents a greater than 20% increase in a single year. Game event participation grew even more steeply, with over 250,000 event tickets yielding an over 26% expansion throughout the Best Four Days In Gaming! The Family Fun Pavilion continues to be popular with the next generation of game players and their parents. Companies with all-ages entertainment products were swarmed with children, grandparents, educators and librarians looking for games for upcoming birthdays, holidays and back-to-school. Between family fun and regular Sunday badges, nearly 3,000 additional people joined Gen Con Sunday – adding considerable traffic to the show and helping exhibitors reach new fans. Over the years, Gen Con has maintained its efforts in helping children and benefiting educational programs through its charity events. This year to keep up the tradition, Gen Con chose School on Wheels, which enhances and enriches educational opportunities for school-aged homeless children as the recipient of the charity fundraising. 100% of the proceeds from the following charity events were donated to the cause: Ace of Aces VIII– Charity Speed Paint and Auction, Cardhalla, and Charity Auction, Fandom United Jail-n-Bail. In total over $18,000 was raised from all the different charity events at Gen Con. Gen Con has been in Indianapolis since 2003 and has signed a five-year extension with the Indianapolis Convention & Visitors Association (ICVA) for 2011-2015. Below are the upcoming show dates. Gen Con, LLC produces the largest consumer hobby, fantasy, sci-fi and adventure game convention in North America. It was acquired in 2002 by former CEO and Founder of Wizards of the Coast Peter Adkison, who owns the company headquartered in Seattle, Washington. Gen Con is a consumer and trade experience dedicated to gaming culture and community. For more information visit the website at www.gencon.com . For up-to-the minute details, find us at www.facebook.com/genconindy and at www.twitter.com/gen_con . I met a lot of people that I've only known as tiny Twitpics and screen names on Twitter, Google+, and forums like RPG.net. That is one of my favorite parts of any convention, connecting to others. I'm kind of weird that way. I also got to meet Steve Jackson of Steve Jackson Games, Munchkin, GURPS, Ogre, et al. As a matter of fact I got to speak briefly with him between GenCon meetings and record our talk. That will show up here in the next couple of days, once I am home and rested up again. I also got to meet Alex and Patrick of Crafty Games and talk with them about some of their upcoming plans. I have the primer for their upcoming Mistborn RPG (based on the novels by Brandon Sanderson). That is in my queue to read and write about on here. I think that the Mistborn RPG is going to surprise a lot of people who think of Crafty as being these super-crunchy designers, due to the volume of rules in Spycraft 2.0. Mistborn is a rules light game with an emphasis on storytelling that has me interested. I'm sure, beyond when I write about the primer, that I am going to have more about that to share with you in the future. I did a lot of Tweeting from GenCon. It was nice to expand the number of tools that I can use in covering an event. There were a lot of eyes on my Twitter feed during the Margaret Weis Productions panel where they announced that they were going to be producing a Marvel Heroes RPG (based on the Marvel comics). I am really psyched, excited, and many other enthusiastic adjectives about this announcements. I do still have to track down Cam Banks for some follow ups, but GenCon is a very busy convention and with everyone working it can be hard to sync up schedules. Speaking of Margaret Weis Productions, I also have a copy of their Dragon Brigade Quickstart. This is a swashbuckling fantasy game coming out from them, based on one of Weis' writings. The implementation of Cortex+ for it looks very interesting to me. On the last day of GenCon, I managed to pick up a copy of the new Fate edition of Kereberos Club. If you don't know about this, Kereberos Club is a Victorian-era super-powered setting from the mind of Benjamin Baugh and published by Arc Dream Publishing. Originally published using the O.R.E. rules, this is the third version of the setting published for different rules sets (the other being for the popular Savage Worlds rules). I have been looking forward to this for a while, having followed the blog and forum posts of the author. Having discussed a relaunch of Heartquest as a Fate-powered game, I think these rules are definitely going to inform what I do with that game. I got to meet Mike Olson, the author, and had a very short talk with him. I did get his card, so we'll talk more int he future. Mike does, by the way, get bonus points for having a random job table on the back of his card. All in all, a busy convention, but it was a lot of fun. It was tiring too. Right now, I am sitting in the food court of the Indianapolis airport, drinking some coffee while I wait to be able to check in with my airline going home. I thought I would fire off a blog post (since the spotty and generally crappy wifi at the convention made liveblogging problematic at best) and wrap up my feelings about this, my second ever GenCon. Thursday I spoke with one of the Brand Managers for D&D from Wizards of the Coast. The topic was the new Neverwinter campaign setting launch from the company. You can see the initial press release sent out by Wizards over here. There has already been some controversy over the above-linked press release due to their wording of the "It is the first-ever RPG book focused solely on one city" statement in the press release. There's been a number of negative comments about the release and it's language in the comments of the above-linked post, internet forums like RPG.net, and other places around the internet. While unfortunate, I don't think it was an intentional slight against the many, and the many classic, game books that have been created about the various city settings in gaming. Talking with Shelly Mazzanoble, she told me about the new angle on organized play for D&D, the Lair Assault. From the press release: "Beginning this September, devoted Dungeons & Dragons players worldwide will have the opportunity to gather at their local participating game stores as part of a new, highly tactical D&D Organized Play program named D&D Lair Assault. The first challenge, Forge of the Dawn Titan, will feature thrilling “convention-style” play that players and spectators alike are drawn to, challenging players on two levels – character building and tactical knowledge." Lair Assaults will be two hour programmed events in retails spaces (like the existing organized play). The interesting thing about them is that they will be customizable adventures. This means, for example that a trap in the adventure could be a pit one time taking the adventure, and it could be a poison spray or some other danger the next time after. This is an innovation that I like because it means that you can get multiple uses out of the same adventure. I find this a fascinating idea. I'm not a 4E player but I have to say that I am curious to check this out, and will definitely stick my nose into an adventure after September first. I did ask Mazzanoble about a common concern of some D&D gamers (both on and offline). That concern is that the tabletop origins of D&D could be abandoned for greener pastures. With canceled 4E products and more and more board games being announced, there are a number of gamers who are concerned about D&D not being a tabletop RPG game one day. When asked, Massanoble said "D&D at its core will always be a tabletop RPG." She went one to say that the shared, multilevel experience of D&D had too much depth and history behind it to ever disappear. 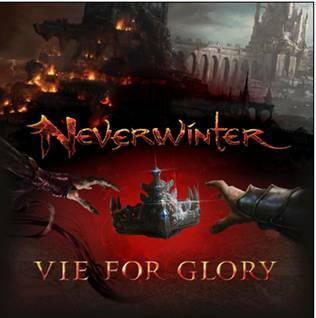 Below is a video trailer for Neverwinter that was provided by Wizards of the Coast. Watch and enjoy. Edit: I did ask my contact for a followup on the controversy over the "first-ever RPG book focused solely on one city" statement in the initial press release and I was told that they did not have the capacity for a formal response. I don't know if this is a dead end, or if I will be able to track someone down or not. I did want to post a progress report. GenCon is chaos and, unfortunately has has terrible, terrible connectivity issues. Makes it difficult to the the blogging that that I am actually at GenCon to do. Those following m Twitter feed will have seen what the big Margaret Weis Productions (MWP) announcement on Friday was that they now have the rights to produce an RPG based on the Marvel Comics universe. I think that this was the big announcement of the convention. Fantasy Flight Games Star Wars announcement was big as well, but since that happened before GenCon started, they do not get the coveted "big announcement of the convention" prize. Outside of the fact that they will be using a variation of the Cortex system (what MWP calls the Cortex Plus system), we don't know much in the way of specifics. Last night I was supposed to talk to Cam Bank of MWP after the ENnies, but the chaos of the moment (and the fact that MWP won a Judge's spotlight award for Smallville). Once I can arrange another meeting with him, I will find out the details that he can release to me. There will be a release of a "basic" book featuring all of the rules for play in February of 2012. This will be a complete game, and it will feature some of the Marvel Heroes, but which ones have yet to be determined. The license covers only the comic books. Movies, cartoons and other spin-off media will not be covered under the license. The packaging of the books will closely follow that of what Marvel uses for their compilations so that the games can be shelves along side of trades and hard cover compilations. I am assuming that they will be using trade dress similar to that used by Marvel Comics. The event/campaign books will come in two formats: an "essential" edition that will be used with the core book released in February that will feature the campaign plot, character write-ups and information, but will not contain the rules that are in the basic game. A "premium" edition of each event/campaign book will also be released that will contain all of the rules needed for play, for those who would rather just have a specific event and play it out of the book, rather than collect all of the various events. I have to say that I like this strategy, and I will probably do a mix of the basic game, essentials of interest and the premium versions of events that were particular favorites of mine (I can see wanting stand alones for the original Kree/Skrull War and Annihilation, perhaps). This is a nice approach because using premium editions with various essentials as supplements will allow groups to customize the creation of their own Marvel Universes. MWP and Marvel are working in what they referred to as a close partnership, and once was called "working in tandem," giving MWP an unprecedented level of closeness when it comes to approvals (this last bit is paraphrasing on my part). I think this is important for a release schedule of sixteen books in fifteen month. Having synergy with Marvel will make, or break, this project. On the topic of synergy, MWP has already been in talks with Barnes & Noble and Hastings about sales synergy that will see the game sold in close proximity to the Marvel trades and hardcover editions of story lines. More information will come, as I get a chance to talk to Cam Banks, but I wanted to make sure that I was able to post a starting point for the conversation about the upcoming Marvel RPG, with the information that is currently available. Right now I am propped up against a back wall in the Exhibition Hall of GenCon, collecting my thoughts and trying to put down some words of my first thoughts on the con. Pictures will follow because, unfortunately the WiFi doesn't't like my netbook right now. That will probably make this post shorter, because while blogging from my phone is cool (and it males me feel a lot like a character from a William Gibson novel) its really not the easiest method for doing this. This place is busy. The Will Call line was huge and stretched out the door. I heard conflicting stories about the length of the line. One person said it was a block long, while another said the line was four blocks long. Regardless, it was long. Cubicle 7 has a good booth. The One Ring slipcover edition looks gorgeous. The variety of the books that they produce is staggering. Sadly, Airship Pirates had not yet arrived. If you haven't heard of Airship Pirates, it is a steampunk RPG using a variant of the Hersesy Engine that powers Cubicle 7's Victoriana game that is based upon concepts from the albums of steampunk band Abney Park. I've been looking forward to this he since it was first announced. I have also spoken briefly with Cam Banks of MWP and got a copy of the quickstart of their upcoming fantasy version of the Cortex system, based on a setting created by Margaret Weiss. The art is great looking and I am eager to read the quickstart. I will be talking to Cam Friday, to discuss the new Cortex+ license coming up from them. Palladium has new books for a variety of their limestone. Armaggedon Unlimited for Heroes Looks fun, in a Swinging 70s sort of way. The con has been good also for meeting with and putting faces to some of the names that I have been talking with online. Sarah Newton, of Cubicle 7, and I got to meet and chat, after talking on Facebook and Twitter for a while. There's a lot of cosplayers and people dressed in a variety of looks. It makes for a fun environment. Not so much fun are the Cosplay Deviants booth, representatives of an adult website that sell access to "geeky" women taking their clothes off. Not the best for a convention trying to show itself as being family friendly. And the Star Wars License Is Revealed! Find out more at the FFG website. At first I thought that announcing this now was an odd choice, being two days before the start of GenCon and all, but as I thought about it I realized that now FFG will have the big buzz for the duration of the convention (even without a Star Wars game at the con). Gamers love their Star Wars and this news will eclipse all the big releases in my opinion. What is now going to be interesting to see is what Margret Weiss Productions are going to be announcing as their new license in a couple of days. No where near as big, to a lot of gamers, I'm sure but still interesting to watch for. AUGUST 2, 2011 – INDIANAPOLIS – Wizards of the Coast today announced that its iconic roleplaying game of fantasy and imagination, Dungeons & Dragons®, will return to one of the most well-known and fascinating cities within D&D lore and the Forgotten Realms novels – the city of Neverwinter. Along with the new D&D Neverwinter Campaign Setting comes an extensive suite of products and in-store play offerings, including a new comic mini-series, a board game, organized play sessions, and a new novel from New York Times best-selling author R.A. Salvatore. Wizards of the Coast will showcase new Neverwinter product offerings at Gen Con Indy 2011 on August 4-7 at Booth #2031, and fans can also get in on the adventure at www.ExploreNeverwinter.com. “The Neverwinter suite of products and programs offer something for all players and fans, both new and seasoned,” said Liz Schuh, Dungeons & Dragons Brand Director, Wizards of the Coast. Neverwinter Mass Adventure at Gen Con 2011 – Show attendees of Gen Con Indy 2011 will have the opportunity to participate in a Neverwinter adventure using a series of QR codes to guide attendees to different Wizards of the Coast sponsored special events and locations. Attendees will be challenged along the way to choose between a quest for glory, a quest for power, or a quest for riches with hints provided by D&D on Facebook and Twitter. Neverwinter Game Day – On August 6, join D&D players around the world for an epic day of Dungeons & Dragons. This year, D&D Neverwinter Game Day spotlights an exclusive adventure entitled Gates of Neverdeath, in which characters are introduced to the intrigues and dangers that await in the city of Neverwinter. For the first time, players will create their own D&D characters at the event and play in a prelude adventure to the upcoming D&D Encounters season! Visit the Store and Event Locator to find participating retailers. D&D Encounters: Lost Crown of Neverwinter & Fortune Cards – Beginning August 10, players both young and old will gather on Wednesday evenings in local game stores around the world to experience the D&D Encounters Lost Crown of Neverwinter season. D&D Encounters is the first D&D Organized Play program designed exclusively for weekly play at retail locations worldwide – and this summer, adventuring parties will be hot on the trail of the Lost Crown of Neverwinter. D&D Neverwinter Fortune Cards, which launched this summer, enhance D&D Encounters game play by adding an element of unpredictability as each card provides a game effect that enhances attacks, defenses, or other benefits to characters. Neverwinter Campaign Setting – The Neverwinter Campaign Setting is the ultimate encyclopedia on the inner workings of the city of Neverwinter, containing everything from history and geography to character themes. It is the first-ever RPG book focused solely on one city and conveniently presents Neverwinter content in a single hardcover format containing information for both players and DMs. D&D Lair Assault – Beginning this September, devoted Dungeons & Dragons players worldwide will have the opportunity to gather at their local participating game stores as part of a new, highly tactical D&D Organized Play program named D&D Lair Assault. The first challenge, Forge of the Dawn Titan, will feature thrilling “convention-style” play that players and spectators alike are drawn to, challenging players on two levels – character building and tactical knowledge. The Legend of Drizzt: Neverwinter Tales Comic Mini-series — For a lighter story, fans can pick up the new 5-part mini-series The Legend of Drizzt: Neverwinter Tales comic mini-series this summer. Published by IDW and co-written by R.A. Salvatore and Geno Salvatore, the comic mini-series delves into the characters that inhabit Neverwinter as the city teeters on the brink of chaos. D&D Heroes of Neverwinter Facebook game – For lighter digital game play, fans can also take part in the D&D Heroes of Neverwinter game on Facebook, a turn-based strategy game launching this summer with pre-fabricated or user-generated dungeons, gifting and more. Neverwinter, The Neverwinter Saga Book II by R.A. Salvatore – With a fascinating cast of new secondary characters, Neverwinter launches on October 4 and takes the dual-scimitar wielding dark elf Drizzt and brings him to an area of the Realms he’s never adventured in – Neverwinter. With the last of his trusted companions having fallen, Drizzt is alone—and free—for the first time in almost a hundred years. Forced to see the dark deeds of common men, Drizzt begins to find himself on the wrong side of the law in an effort to protect those the law has failed. The paperback release of Gauntlgrym, The Neverwinter Saga Book I by R.A. Salvatore that lays the groundwork for all of the Neverwinter product offerings this fall, just released on July 5th. The Legend of Drizzt Board Game – Launching October 18, this thrilling board game is based on the adventures of Drizzt Do’Urden, as told in the New York Times best-selling Forgotten Realms novels by R.A. Salvatore. Players take on the role of the legendary drow ranger or one of his famous adventuring companions, battle fearsome foes, and win treasure and glory. Dungeons & Dragons is the iconic roleplaying game of fantasy and imagination that is part storytelling, part social interaction and part chance. Visit DungeonsandDragons.com for more details on the Dungeons & Dragons follow D&D on Facebook and Twitter. Wizards of the Coast LLC, a subsidiary of Hasbro, Inc. (NASDAQ:HAS), is the leader in entertaining the lifestyle gamer. The company holds an exclusive patent on trading card games (TCGs) and their method of play and produces the premier trading card game, Magic: The Gathering, among many other trading card games and family card and board games. Wizards is also a leading publisher of roleplaying games, such as Dungeons & Dragons, and publisher of fantasy series fiction with numerous New York Times best-sellers. For more information, visit the Wizards of the Coast Web site at www.wizards.com.